Like any 90's kid, I was a bit of a trouble maker who loved cartoons. So much so I couldn't stop watching television. It got so bad that on my exam week, my wonderful father had to duct tape a huge illustration board on our Sony tube (or was it Panasonic? Never mind.) just to stop me from my obsession. One of my favorites at the time was Scooby-doo. I could never get enough of those 'meddling kids and their mutt.' In fact one of the more common themes is that you would always find them hanging out inside the 'Mystery Machine' and inside the 'Malt Shop.' A malt shop or a soda shop is where kids get their soda and confectionary fix. You know, to get high on sugar or in this case to cool off from the summer heat. So visiting the 'Farmacy' sounded like a good idea for cooling off and for nostalgia reasons. 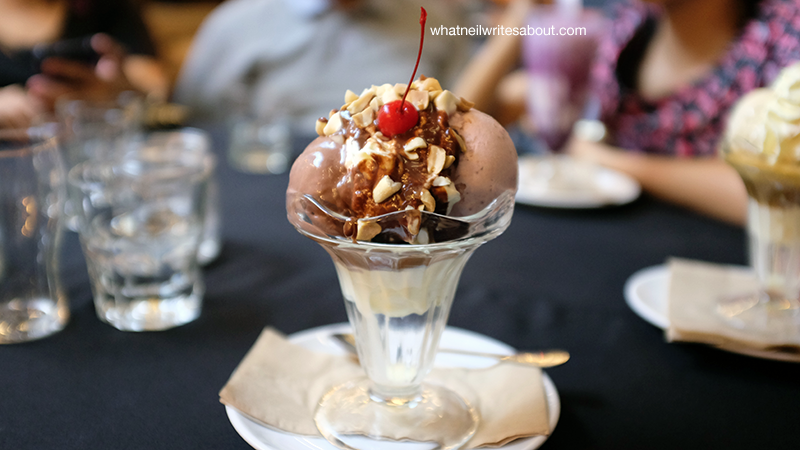 Farmacy's Classic Sundae: Chocolate, Vanilla & Strawberry Ice cream topped with nuts, syrup and of course, cherry! The timing couldn't be better because the thing about summer in Metro Manila is that you know it has arrived when you feel that lingering hot air on the surface of your skin like the air around a loaf of bread fresh from the oven. According to Google Now, the temperature at the time was 34 degrees Celsius. So as much as I wanted to return to 'Silantro,' I think the spicy food can do more harm than good. 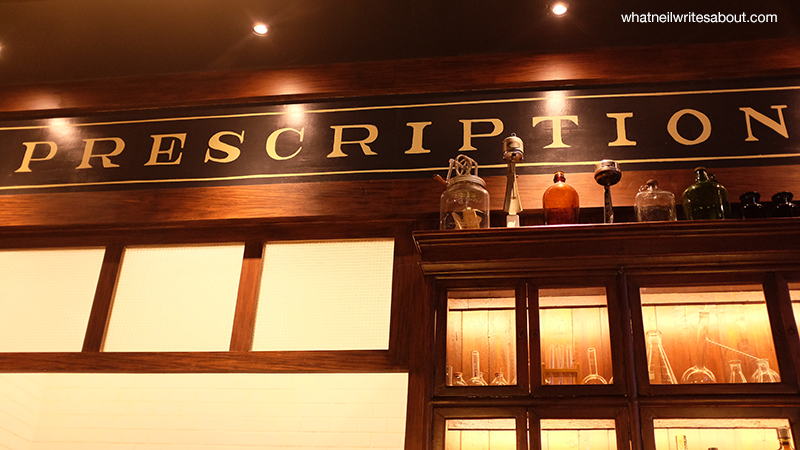 Farmacy is located at the corner of 4th and 26th street at the Fort, Global City. It wasn't that hard to find. From St. Lukes' Global City, go straight along 5th street in the direction pointing to the nearby McDonald's. You then turn left on the 26th street and then stop at the corner. Yes, I believe they have the same owner. Decadence, I think is their specialty. 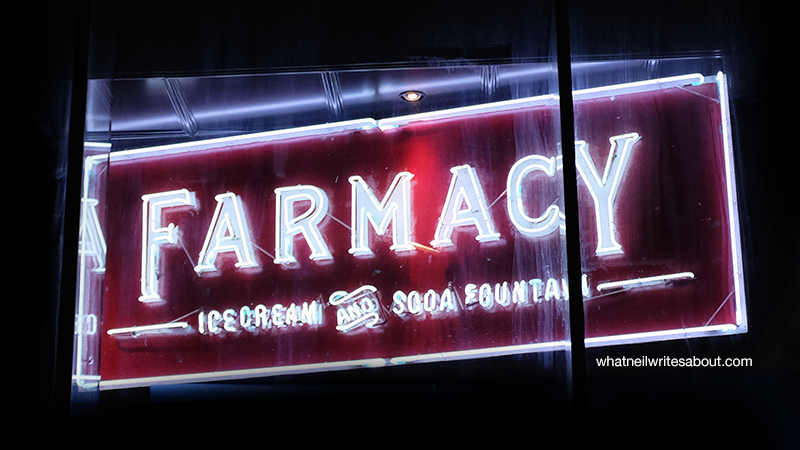 The Farmacy Ice Cream and Soda Fountain Neon Sign! After being greeted by the neon sign, Me and my family were received warmly by the Farmacy staff. I went on ahead and let my family seat while I look around. I found myself in front of the glass doors where I can see the long bar where the ice cream and soda fountain stands. As I go inside and look around, I immediately was made even hungrier by the smell of the sweet stuff lingering though the air. The look of the place reminded me of those stores from American period films from 70s and from 80s. It is quite the delight if you are into those things. You could tell that they spared no expense in terms of aesthetics. I came back to our table and I was given their classy period style menu with matching typography. I noticed that majority of the seats were outside because you come here for are the cold beverages and the cold desserts and being inside an air conditioned room could help drop your body temperature further. The Period style aesthetics is top notch! 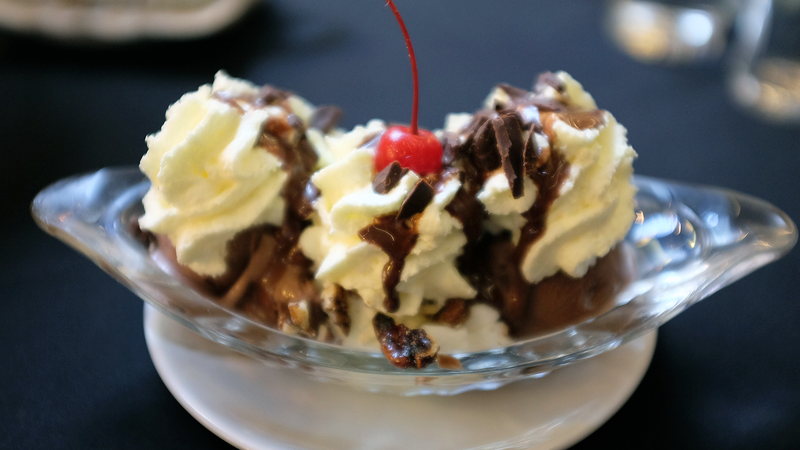 For the past few years dessert focused businesses have been popping up everywhere, and every time a new one arrives the decision of finding the one place to get your decadent fix is getting harder. 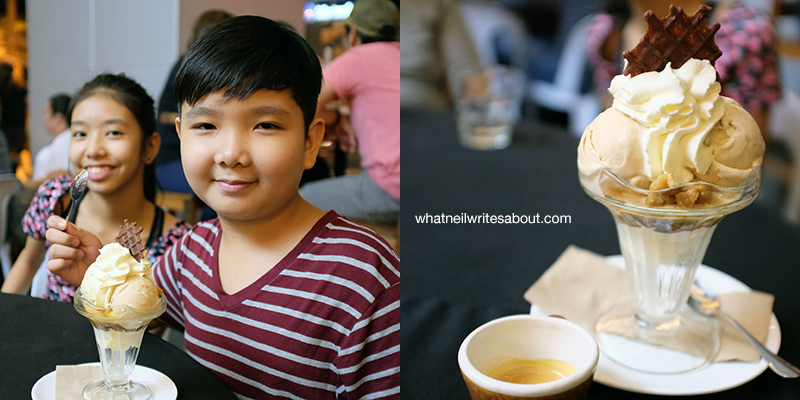 The answer lies in the details and the Farmacy spares no expense in their Ice Cream. In terms of flavor, the strawberries are fruity sour. The chocolate is bitter sweet with hints of (what I think is) hazelnut. The coffee flavor isn't too strong, and has a nice kick in both flavor and buzz. The consistency is so creamy that they just melt as soon as they touch the tip of your tongue. The Pick-Me-Up Sundae is a good way to recharge! Coffee flavored Ice cream with Nuts and a shot of espresso. They also serve Ice cream sandwiched between two cookies (I know, Genius right?) that you pick when you order. We picked the Chocolate cookies. After we took that first bite we immediately felt the chocolate in the cookies flooding our mouths and then slowly it blends with the ice cream creating a wonderful argument between the sweetness of the ice cream and the slight bitterness of the chocolate. What stood out aside from that is the hardness of the cookies. We understand that the cookies have to be a little sturdy so as the ice cream won't make the cookie crumble. Maybe I should have let the Ice cream soften the cookies. Next time. On the left is the Dusty Road Sundae and the Berry Soda float is the one on the Right. 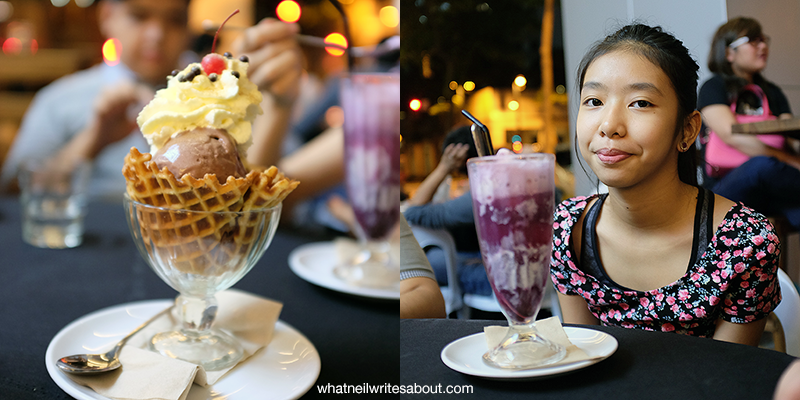 My dear sister ordered the berry soda float. When you take that first zip, the realisation that commercial sodas are too sweet hits you like a brick. It's like a bubbly berry fruit juice but with its sweetness restrained. Restrained in a very good way. It doesn't over power anything. In fact, it blends so well with the berry flavor that when the Ice cream melts (or when you mix it vigorously) the soda slowly becomes more creamy, and since the sweetness was restrained, you don't lose the berry sour goodness. What takes the cake however is after consuming all of it. Normally, We noticed after eating SOME of the ice cream found in grocery stores is that after finishing my share, We still found our selves wanting even though we ate a pint all for ourselves. It was empty. After finishing this ice cream however, You'll be happy to hear that it is quite satisfying. 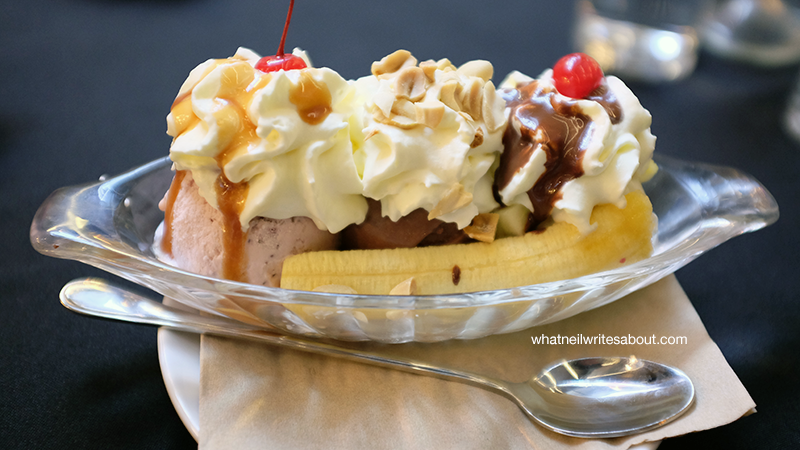 The Classic banana split topped with whipped cream, peanuts, chocolate syrup and cherry! When we arrived were right away greeted warmly. As we were lead to our table, it was a little disappointing that we were seated at mono block tables and chairs where as every body else were given the wooden picnic tables and chairs. I hope they remedy this. Thankfully they waited patiently. It took us a while to finish ordering but we made it. After eating we had several refills of water. Sugar can cause dehydration. They would then deliver the water refills promptly every time. I have read some reviews of this place saying that the service are at times inflexible. I didn't find it when I was there. I sure hope not to find it next time. P.S. Personally, I find this place as an alternative to meeting your friends or special someone aside from the usual coffee or tea rendezvous. If you just want something a little less pricey, you could just drop by your grocery and buy a couple of pints of Ben & Jerry's. It is cheaper and Ben & Jerry's do have a wide Selection. I would only come here if I were out with my friends and just want to chat and cool off. Don't get me wrong though, I like this place. I am just being practical. Thanks for reading! If you like what you read please like and share whatneilwritesabout.com.